OREM – For the first time in over 10 years, there was not a Region 9 team in the 3A or 4A finals for Utah state volleyball championship. Despite getting two teams to the semifinals, both Desert Hills and Snow Canyon lost to their opponents and had to settle for their third matchup of the season in the consolation game for third place. Those opponents, Park City and Sky View, squared off for the 4A title and the Miners knocked off the No. -1 ranked Bobcats in straight sets, 25-23, 25-21, 25-21. Park City ended up dropping just one set in four matches at the state tourney en route to the 2017 state 4A title. Who wants to play for third place after being eliminated from championship contention? Usually nobody. The NCAAs did away with their consolation game for March Madness back in the early 1980s. Somebody forgot to tell Snow Canyon and Desert Hills, though. The game marked their third meeting of the season. 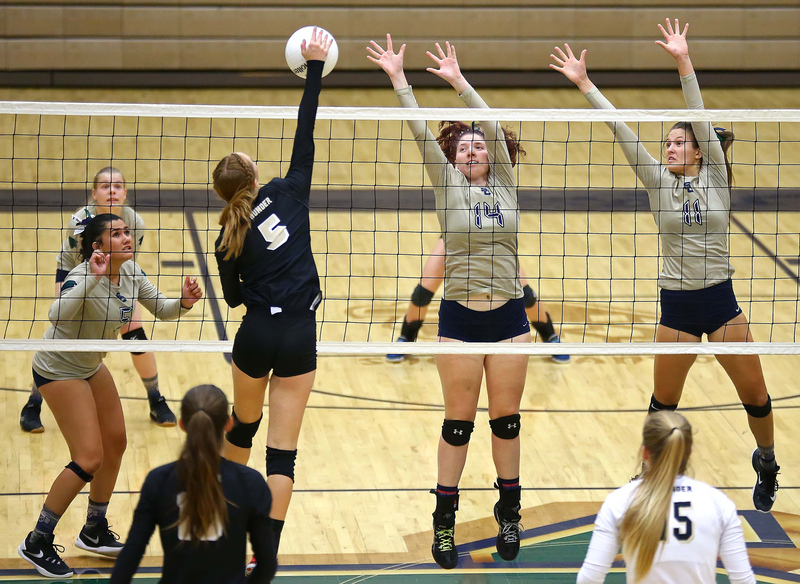 In Round 1, the Lady Thunder escaped Snow Canyon and three Warrior match points to win in five sets. Desert Hills then won convincingly at home a few weeks later. The Lady Warriors had something to prove Thursday and Desert Hills was not about to lie down for them. The Thunder ultimately prevailed in the five-set thriller, 23-25, 25-22, 25-17, 12-25, 15-4. In the first set, it was the Warriors that jumped out to the lead. But their lead would never gain much traction as Desert Hills kept them within sight. The two teams tied late for four consecutive points, the final at 23-23. Then, after a Sammi Johnston kill got the Warriors a side out, Jael Wilde hit a service ace to take the first set. 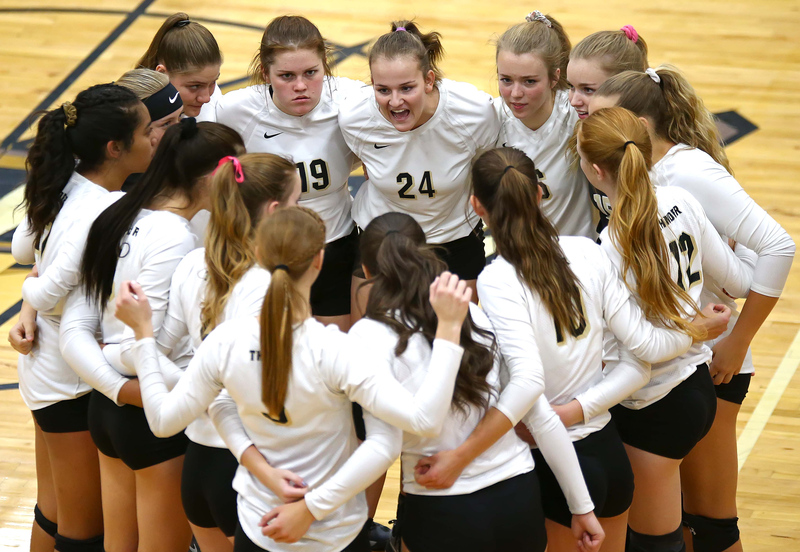 In the second set, the Warriors again took the early lead, but Desert Hills fought back and finally put some distance between the teams at 16-11 before Snow Canyon head coach Ryan Rarick called a timeout. The Thunder’s momentum continued, however, and Desert Hills took a 21-14 lead. Snow Canyon came back to within 22-18 when Desert Hills head coach Sharon Christensen called a timeout. A block by Hallie Remund and another Johnston kill pulled the Warriors to 22-20. Two more Johnston kills pulled the Warriors to within one at 23-22 when Christensen took the Thunder’s second timeout of the set. Madi Clark’s kill got the Thunder to game point and the set ended on a Thunder block by Kami Bliss. In the third set, the Thunder raced to a 5-0 early lead. Snow Canyon fought back and tied the game at 11-11. Desert Hills then went on a 9-2 run. Rarick called a timeout at 18-13. Kylee Christensen’s block had the Thunder up 20-13. A service ace from Saselah Goulding had DHHS up 23-15. The Thunder then closed out the set behind Clark’s service. The fourth set was all Warriors. Snow Canyon jumped out to leads of 9-1 and 13-3 before the Thunder staged a mini-comeback. The Thunder pulled to within 14-8, but that was as close as they would get. Shayla Harris’ service ace put the Thunder up 17-8. Lizzy Rowland then connected with her own ace to get the lead back to double digits, 19-9. Coach Christensen called her final timeout of the set, but that did not stem the flow. Remund had a kill to put the Warriors up 21-9. Johnston’s kill got the Warriors to set point, 24-10. A collective block by North and Addie Tauanuu scored the set point for the Warriors. Then it was as if someone flipped a switch. The Thunder came alive and the Warriors disappeared. Back-to-back kills by Christensen and Beck gave the Thunder a 4-0 lead in set five, prompting a Warrior timeout. The onslaught continued, however, and Rarick had to use his final timeout facing a 10-3 deficit. The Warriors would get a side out, but that would be the last point they would score. Bliss’ kill put DHHS up 11-4. An ace by Goulding combined with a kill from Clark put the score at match point. The Warrior attack went long on the final point. Individually for the Thunder, Clark and Beck had 18 kills apiece. Bliss had 10 kills. Christensen led the team with four blocks. Andie Sonju and Goulding had 19 assists each. Recording double-digit digs were Andie Sonju (24), Halle Sonju (23), Beck (21) and Christensen (13). For Snow Canyon, Johnston led with 22 kills and 23 digs. Tauanuu led the team with 24 assists. Remund and Rowland had four and three service aces, respectively. Wilde had 14 digs. Remund led the team with three blocks. “It’s tough to end the season with two losses,” said Rarick. “But Sky View and Desert Hills are quality opponents and we have no reason to hang our heads. I told the girls that I was proud of how they responded to adversity. Every time we had a disappointment, or breakdown, we responded with grit and determination. The Thunder dominated in the first set, but then came out incredibly flat in the second. The Lady Miners carried that momentum and took the match in four sets, 20-25, 25-13, 25-22, 25-20. Individually for the Thunder, Madi Clark and Allie Beck led the team with 12 and 10 kills, respectively. Beck also led the team with 16 digs. Recording double-digit digs were Saselah Goulding (12), Clark (10), Kylee Christensen (10) and Halle Sonju (10). Kami Bliss led the team with three blocks. Andi Sonju and Goulding led the team with 19 and 17 assists respectively. The No. 1-ranked Lady Bobcats looked like they were going to make quick work of Snow Canyon, easily taking the first two sets. The Lady Warriors jumped out to a late lead in the third set however with a 19-13 advantage. But Sky View fought back, took the game into overtime and eventually got the sweep 25-13, 25-18, 27-25. Individually for the Warriors, Sammi Johnston and Lizzy Rowland had nine and seven kills, respectively. Addie Tauanuu had 15 assists. Johnston led the team with 12 digs. Savannah North had five blocks. It looked like the quarterfinals loss from Wednesday night took the wind out of Dixie’s sails in Thursday’s match against Mountain Crest. The Lady Mustangs swept Dixie to advance to the fifth-place game 25-18, 25-21, 25-21. Ella Burrows led the Flyers with 13 kills. Lauren Beatty and Savannah Wilson had five kills apiece. Pretty sad that our girls from region 9 are not worth someone to go up and take pictures of the teams and their hard work. Why do boys sports trump girls sports? Not too cool of you.